Dodging the Bullet: “King Lear” ‘Does Such Things’ to the Audience | The Gettysburgian. The audience is silent, the lights are dim, the fog machine sets the scene with an ominous edge; senior Christian Boor walks out on stage, looks about inquisitively, and begins his eloquent first lines that begin The Majestic’s production of King Lear by William Shakespeare. The show ran from Thursday, March 1st to Sunday March 4th, and was an absolute hit. The show was directed by Chris Kauffman and featured two guest actors: Paris Peet as King Lear and Gettysburg’s own Professor Richard Sautter as Earl of Gloucester. Besides these two fantastic gentleman, the rest of the cast consisted of students from the college. This was my first production on the mainstage, and I can say that is has hands down been one of the best and busiest times of my life. 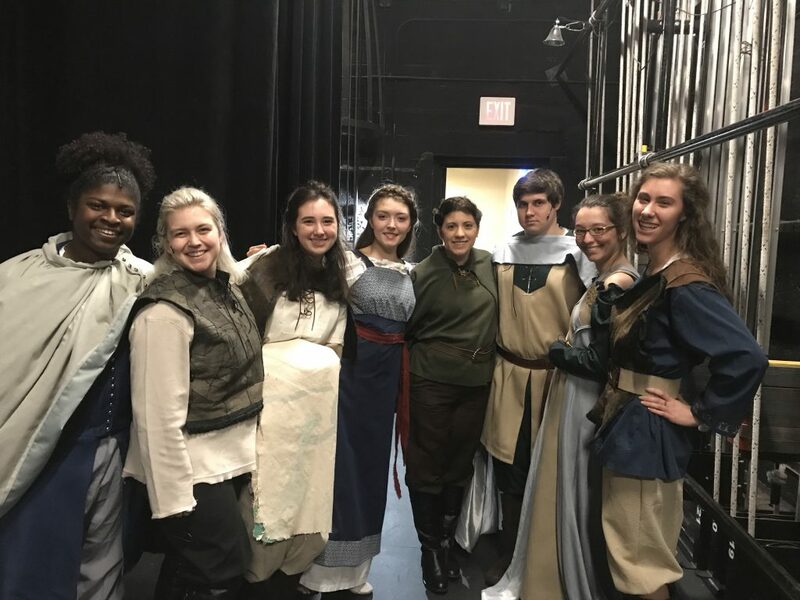 The cast rehearsed practically every day from 4 p.m. to 7 p.m. starting right after winter break, and the leads of the show even came back from break early to help put together such a fabulous production. The hours were long, and the work was intense, but I could not have asked for a better group of actors to work with. Although I am only a first year, they welcomed me into the theater family immediately and made me feel like I had been working with them for years. The cast brought an atmosphere that was professional, but still held the light-hearted camaraderie of a less serious show. As King Lear is a tragedy, it can be a very tough show to pull off well. That being said, when every actor throws themselves entirely into their role no matter how big or small, this is what retains the authenticity of the show. Particularly for adolescents, it can be very difficult to stay serious with such severe material. I found that working with Richard and Paris helped combat this; they are more professional actors, and as such, were a huge help in teaching all of us actors in training how to really tap into our feelings and to listen to what is being said in the show. Early on in rehearsals, I found myself trying to focus on what I thought I should feel and not what I was actually feeling. After a full-cast conversation with Richard and Paris where Richard advised us to “just listen,” I began to focus more on the actual story, on what was happening, and not what was going on inside my head or what I believed should have been happening in my mind. When I felt that moment, it was the first time I ever legitimately cried on stage. In conclusion, King Lear is not entirely a show about death and destruction as it seems to be. It is a show about family, understanding, emotional pain, and companionship. The cast of the show brought all of these elements to light with graceful professionalism, and I am so proud to be able to say that I was part of such a wonderful, heart-wrenching production. Jennifer Clogg '21 hails from Gaithersburg, Maryland. She intends to double major in English and Spanish and is undecided on any minors. Jennifer is an editor and planner of contests for The Gettysburgian. As a Gettysburg student, she plans to participate in theater and intramural softball. Fun fact: Throughout all of high school theater, Jennifer only played a female character once because she came from a very small high school with many more girls in the theater program than boys, leading her often to take male roles that the other girls were unwilling to fill.